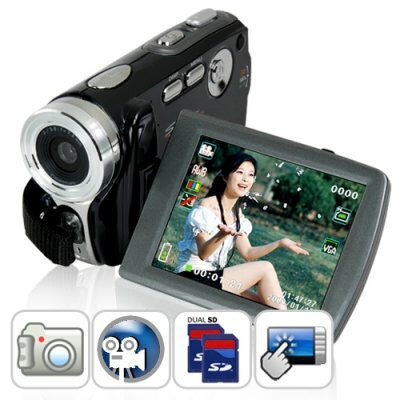 Successfully Added Digital Video Camcorder w/ Touchscreen (Dual SD Card Slots) to your Shopping Cart. Great storage, great optics, and great features - all for a great price! That's what you get with this digital video camera that shines with a 3 inch touchscreen and not one, but TWO SD card slots! Whether you're looking to capture family videos and photos or you're an aspiring movie or Youtube video director, the CVSE-004 is your perfect partner with the perfect price. It comes with not one, but dual SD card slots so you'll never run out of storage space. This comes in handy when you need to hand over one of your SD cards for processing - you'll always have another SD card loaded up to capture the unexpected! The CVSE-004 also comes with an advanced 5MP CMOS image sensor that allows you to take 30 frames per second (fps) 1024 x 768 videos in the popular AVI format as well as stunning still photos in multiple resolutions up to 16MP! Perfect for someone who doesn't want to carry a digital camera as well as a camcorder with them everywhere they go - this baby gives you the best of both worlds in one very attractive unit! Everything about this camcorder was designed to make it user friendly. Take the 3 inch touchscreen viewfinder for example. No longer will you have to awkwardly navigate menus using tiny buttons. With a touchscreen display, you see it, you click it, you get what you need done in a flash. You also have a choice of whether you want to use the included rechargeable battery for power or you can use AAA batteries as well - this is a huge bonus for many of us who run out of rechargeable power midway through a fun day at Disneyland. With the CVSE-004, simply buy some batteries from the store, load them into the camera and you're good for the rest of the day! Buy this unit today and we'll ship it out tomorrow. You get an excellent wholesale price and we'll even dropship it to your customer. The kit includes everything you need to get started - camera, battery, charger, USB and AV cable. All that you need is an SD memory card and your enthusiasm! I want to make a movie but I need a plot, can you help me out? Try this one out. Brilliant dropshipper lists the CVSE-004 on his website. He makes tons of money and retires rich. Spends the rest of his days on his own island in the South Pacific. Yes, for USB file transfer it is compatible with most computer types. However the included evaluation software is only for Windows PC's. Is this digital video camera as good as the Samsung or Casio unit I saw advertised on CNET? Yes. Actually it's even better because it comes with a complete kit of accessories and is being offered to you at a low factory-direct price! on 2010-05-08 08:00:54 Great Product! I am very satisfied with my camcorder and it does all of what they say it does. Quality of this product!! Chinavasion keep the quality up en the custumors will never leave you guys.